Description: Let the charm and warmth of the past light up your home with this handsome Auburn combination gas and electric reproduction Wall Sconce, crafted from Brass in the USA by Meyda artisans. 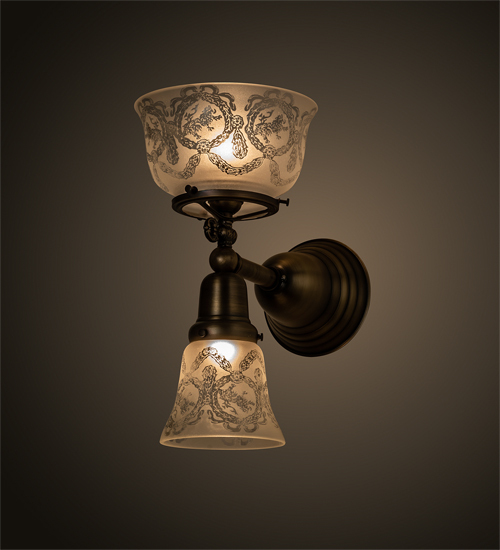 The fixture is hand finished in Antique Brass, and is featured with lovely Wreath And Garland patterned glass shades. The larger glass goblet styled shade provides indirect light upwards and recreates a gas powered fixture, while the smaller goblet shade delivers down lighting and re-creates early electric fixtures back in the day.